The Arduino Micro is a tiny breadboard friendly microcontroller with an ATmega32u4 processor. 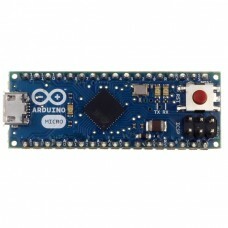 The Arduino Micro specifications are very similar to the Arduino Leonardo. It features a built-in micro USB port and can be programmed to appear as a mouse or keyboard. This tiny board is about the size of a Basic Stamp microcontroller yet can be programmed with the popular Arduino IDE just like any other Arduino. This board is fully assembled with headers. No soldering is required. The only item you need to get started is a Micro USB cable. This is a great processor to use for prototyping Arduino based projects right on a breadboard.